Here, Captain America is asked to look after the niece of Maria Hill … a S.H.I.E.L.D. agent. Hill’s niece developed a computer program and now she’s being threatened. But walking around in his Captain America costume would draw attention, and so it is Steve Rogers who does the babysitting. This book suffers from the same issues that plagued the other two mentioned above. Dull, lifeless, and the known characters don’t seem much like those we’ve come to know through the comics or the movies. Rogers/Cap acts like the jocks that used to pick on him when he was a scrawny kid. He also never seems comfortable around the computer genius, Katherine. Surely this was intended to be a relationship in the making with hero and damsel skirting the sexual tension between them. But for this reader, it never works. Katherine has no character. She’s a stereotypical computer nerd, and then she’s the stereotypical young woman being pursued by bad guys. Cap has no interest in her, and for good reason, but it also means there’s not much to the story. This is a case of way too much narrative. We’re told almost everything and get to experience almost nothing. Instead of being pulled in to a story – and a book based on a comic book superhero and a movie action thriller hero, we should very much be drawn in to this story – we are told to sit back while a story is explained. This is not the way to get teens interested in reading and not a particularly good way to get the older, more dedicated comic book fans to follow along. I’m disappointed that this was such a dud. I really have liked a number of comic book hero-to novel adaptations and would have loved to have added this to my list of interesting comic-related books. Looking for a good book? 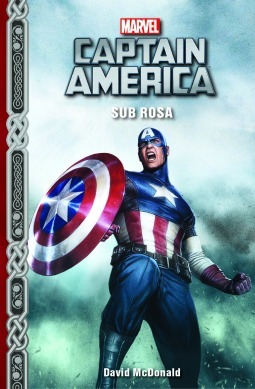 Marvel’s Captain America: Sub Rosa by David McDonald is not a particularly good substitute for the adventurous comics or the thrilling movies.